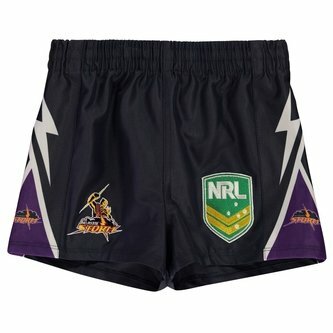 Support the Storm in the 2019 NRL when you pull on these Melbourne Storm NRL Kids Supporters Rugby Shorts from ISC. The Melbourne Storm play their rugby in Austalia's premier rugby league competition, the National Rugby League NRL. The Storm has won three premierships since their inception, in 1999, 2012 and 2017, have contested several more grand finals and were stripped of the 2007 and 2009 premierships, following salary cap breaches. 2018 began in successful fashion for the team but they could not hold on long enough to win the league and instead finished 2nd, something they hope to rectify in 2019. The Storm was always going to go with the colours of their state, Victoria (navy blue with a white 'V'), but club consultant at the time suggested that they should also have purple and gold to make their merchandise more attractive. Just like tradition these shorts use the club's colours. They are predominantly navy with purple and white detailing down the sides. The NRL logo is on the left whilst the club badge is on the right.